There’s no doubt about it — England’s long and passionate love affair with gardening has exerted an enormous influence on the way Americans garden today. A walk through the Helen and Richard Thomas English Walled Garden’s six distinct rooms, all of which demonstrate unique styles, is a walk through the history of English gardening. 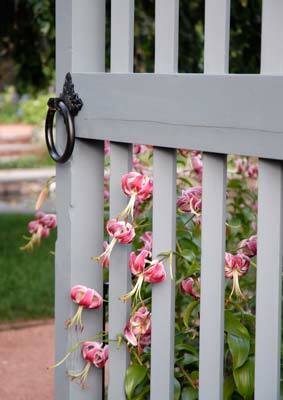 It is also an ideal opportunity for visitors to fill their own gardening dreams with beautifully inspired ideas. The noted English landscape architect John Brookes provided the original design for this garden in 1971, and he continues to visit regularly, checking on the progress of the signature plant specimens that mark each area. The garden can be accessed through any number of entrances or doorways, but the most popular is the doorway beside the long border lining the western wall of the garden, where a delightfully appealing lion statue encourages your entrance. Before going inside, take the opportunity to study this sunny border, filled with profusely blooming bulbs, perennials, annuals, and shrubs, which grow more colorful and exuberant as the seasons progress. Plants of every height, texture, fragrance, and hue are packed together, set against a classic brick wall of the English Walled Garden. This well-designed, often whimsical, collection of sequentially blooming plants is a hallmark of English gardening, and serves as an apt preview of what awaits inside. After greeting the lion, enter the Courtyard Garden, the smallest of the six rooms and a marked change from the riotous plant displays on the other side of the wall. Here, cooling shade is provided by an overhanging apple tree, and the refreshing sound of water comes from a cistern on the wall. Chairs and benches beckon, and the simple color scheme of red, white, and green creates a peaceful contrast to the “wildness” outside. One of the reasons walled gardens originated was to protect food crops, herbs, and medicinal plants from foraging animals. The design elements at work in this small garden are the same principles applied to larger rooms — an emphasis on hardscape (walls, floors, containers, furniture); water; self-seeding plants that spill over and soften walkways, walls, and fences; and color, texture, structure, and fragrance. In all of the rooms there are garden seats and benches to rest, think, and come to know the intimate details of these beautiful plants. 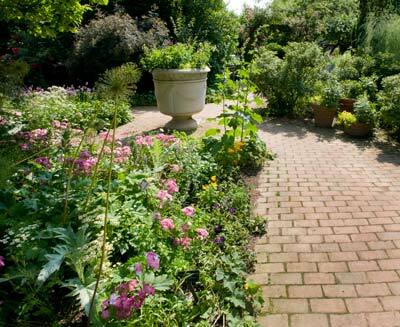 The open, sun-filled Daisy Garden is a change in both plants and hardscape, trading soft yew hedges for brick walls, and crushed terra cotta stone for bluestone and brick floors. Note the deliberate windows cut into the yew walls, which allow views into adjacent rooms as well as distant vistas. Here, every imaginable daisylike plant in the sunflower or aster family is tightly corralled into square beds surrounded by crushed stone pathways. 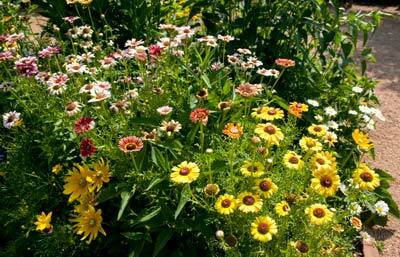 Some of these plants — sunflower, coreopsis, rudbeckia, chrysanthemum, and daisy, are recognizable, but many are a rare sight. From the deepest raspberry petals to two-toned gold and burgundy, the assortment is astounding. To cool down all this colorful excitement and bring a bit of formality to the garden, a raised central urn is underplanted with quiet, soft silver wormwood (Artemisia). The Daisy Garden overlooks the Vista Garden, which in turn overlooks Evening Island, the Great Basin, and some of the most splendid views across the water. Once again, water plays a central role. A large octagonal pool framed by bluestone terraces invites visitors to sit down and reflect on the immediate and distant gardens visible from every angle. Outcroppings of volunteer plants adorn the bluestone seats, and containers of scented geraniums offer fragrance in all flavors. The importance of structure once again is emphasized in balustrades, bluestone surrounds, and in the familiar pepper pot hideaways that offer one of the best views in the entire Garden. 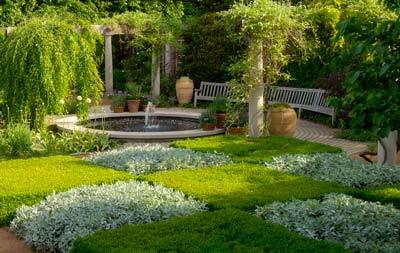 The Checkerboard Garden reinforces the formal theme and employs a typically English technique of tightly shearing plants into topiary forms, in this case two checkerboards of nine squares each, composed of alternating plants, green boxwood and silver wormwood. Topiary is evident throughout the entire English Walled Garden, from the checkerboard parterres to the green yew walls, espaliered crabapples, and much more. See how many examples of topiary you can find. Continuing to the adjacent Pergola Garden, your gaze moves upward to the stone columns and wooden arbors that support the heavy wisteria vines that drape themselves overhead, producing enviable clusters of lavender flowers in early summer. 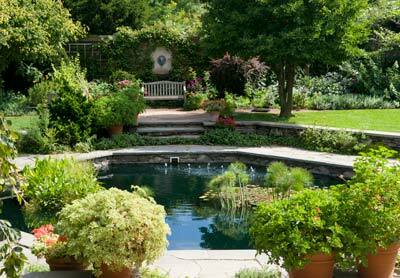 The soothing tone of this garden is echoed in the bubbling circular pool, the presence of majestic weeping trees, and the cool-color plant palette. Once again, ample opportunities exist for sitting, listening, looking, and dreaming. 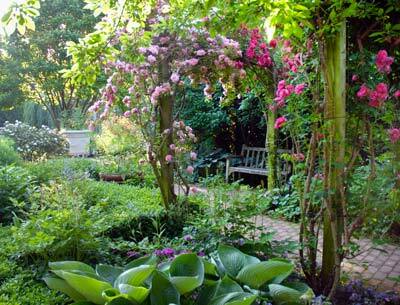 The formal mode changes abruptly in the Cottage Garden, where sheer abundance rules. Perhaps the most important of all gardens in English history, the cottage garden provided rural homeowners with their fruit, vegetables and herbs; their medicine; and often, the grains for their poultry. No wonder spinach grows side by side with roses; tiny thyme plants sprout up underfoot, filling the gaps in the brick walks; strawberries and foxgloves compete in containers; stone troughs and trees share space; and pocket gardens of mixed plants self-seed wherever an open patch of dirt becomes available. Land is precious and every square foot is potted up with usable plants. By the end of the season, the concept of abundance has taken on a new meaning! We encourage you to walk this garden often, in all seasons, to take notice of the smallest Sedum in pots to the most magnificent weeping beeches in full foliage. In winter, the architecture of the rooms, their walls, floors, and décor, will speak to you in a very different manner than will this glorious garden in high season, when the plants are in residence.